Overcome sleepless nights with this Powerful Solution BAs a fitness enthusiast, getting an adequate amount of sleep is essential for fast, massive results. To reach your full potential, it requires a powerful formula to reach your targeted goals. If you are ready to end your restless nights, then ProteinCo Magnesium Complete is the supplement for you. ProteinCo Magnesium Complete is the solution to reduce stress and allows you to sleep comfortably throughout the night. In the process, this formula will boost your vitality---and improving your overall health. There’s no time to waste. Instead put your trust in ProteinCo Magnesium Complete Plus---the powerful sleep aid to overpower your sleep troubles. Improve Deep Sleep ProteinCo Magnesium Complete contains Magnesium Orotate, which provides the release of Catecholamine hormones. At times, insufficient magnesium in the body will impact the central nervous system, and interrupt a good night’s sleep. Magnesium Orotate reduces the levels of stress hormones, thus helping you improve deep sleep. ProteinCo Magnesium Complete contains 50 mg of Magnesium Taurinate, Magnesium Glycinate, Magnesium Fumarate, and Magnesium Orotate. ProteinCo Magnesium Complete helps combat your sleep struggles, so you can function better, and improve mental clarity. This formula is designed to help you sleep at peace while reducing stress. ProteinCo Magnesium Complete will help improve your health and wellness for the long haul while controlling anxiety and sleep troubles. If you are lacking energy and looking for ways to improve your sleep patterns, then ProteinCo Magnesium Complete is your solution. ProteinCo Magnesium Complete will ease your sleep worries and provide you with effective results. Most active athletes have restful nights… but not you. You have trouble falling asleep. You’re not a sound sleeper, and you are faced with unique challenges. Wouldn’t it be great if you could reduce stress, but most importantly, sleep with ease? Now this can become a reality! Packed with Magnesium, ProteinCo Magnesium Complete is your solution. This unique supplement for insomniacs , and allows you to sleep comfortably, no matter how many sleepless nights you’ve had. Reduces Anxiety Magnesium Taurinate helps the ability to boost the release of stress hormones. It reduces the release ACTH(a hormone that reduces the response of adrenal glands)—and acts a blood brain barrier to avoid the entrance of stress hormones inside the brain. This helps the ability to reduce stress---allowing for better mental clarity, you can function effectively throughout the day. Improves Mood Filled with Magnesium Glycinate, ProteinCo Magnesium Complete helps you control mood swings. Magnesium Glycinate helps to stabilize the nervous system and this non-essential amino acid produces a calming effect. Glycine helps to remove mercury from the body which is called Chelation. Since Mercury can cause emotional stress, Magnesium Glycinate is able eliminate the instability--- and allows for a more enjoyable day. Q – What are some natural ways to help you sleep better? A – There a number of ways to help you sleep better naturally. Wild lettuce has been to show to help you sleep better. This natural nutritional food has a calming effect on your body, helping you to snooze better. It is important to try and aim between 30-120 milligrams before bed. Also, try and go to bed at the same time every night. Though it’s hard to do, you should also try and do this on the weekend. This keeps your biological clock functioning properly so you can rest better. Exercise helps to increase the length and quality of sleep. If you sleep for 30 minutes of vigorous exercise, this helps to release Melatonin, which helps you stay drowsy. It is vital that you boost Serotonin with carbohydrates and protein. Foods such as crackers, cheese, turkey, or peanut butter boosts Serotonin, and allows you to sleep comfortably. Consuming these foods within an hour before bedtime is probably your best bet. Q – How lack of sleep affects muscle growth? A –Lack of sleep can be detrimental to your muscle growth because of the effects of growth hormones to your body. Your body releases a growth hormone in a 24-hour period. It is important to exploit this growth hormone for significant results. Men who sleep less tend to notice a decline in growth hormone--which slows the muscle building process. The lower sleep you get, the higher your cortisol levels, which is a hormone that does not favor muscle building. This will not allow you to recover quickly, thus making it hard for you to significant results. When you are weight training, you overload your muscles, and create tears in your muscles. When you lack sleep, this affects your muscle strength and size gain. Furthermore, the immune system helps repair the damage from a strenuous workout the day before or during the day of your workout. It is important to allow your body enough time to recover, as your next workout will be lethargic, and your muscles will not progress. Premium Quality - Strict manufacturing standards and certifications: With its ability to improve overall health, ProteinCo Magnesium Complete is a sleep aid formula that is manufactured to pharmaceutical grade specifications. We manufacture under strict GMP procedures to ensure the quality you require. 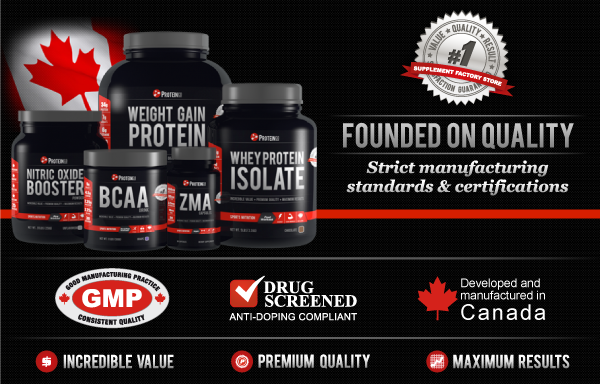 Our quality preserving processes means ProteinCo Canada’s ProteinCo Magnesium Complete features a powerful balance of Magnesium, which promotes healthy sleep for everyday athletes, health-conscious people, and bodybuilders trying to reduce stress in the process. Enhanced Results with Magnesium Complete Plus With its unique blend of stress-relieving components, ProteinCo Magnesium Complete is a great bargain. This supplement will quickly transform your mood, energy levels, and confidence so you can see fast results. Whether you are a competitive bodybuilder, athlete, or an everyday fitness buff trying to change his or her fitness lifestyle, ProteinCo Magnesium Complete is your answer for better sleep. You don’t have to worry restless nights anymore. Instead, put your trust in Magnesium Complete Plus. Your mind and body will be happy you did.